This fresh and delicious salad is made with cucumbers, tomatoes and avocados mixed in with a unique and flavorful dressing. Perfect for the summer! Whisk together dressing ingredients in small mixing bowl. 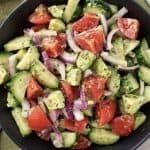 Mix together cucumber, tomatoes, red onion and avocado in a large bowl. Toss with dressing and serve.